Coding & Programming toys use technology to teach you how to think algorithmically and prepare for problem solving in a structured way. Even in the 21st century we continue to use obsolete technology every day, so we need skills that are critical for enabling a transformation from just computer users to creators. How do you teach your children coding basics in a simple way? Using toys! These toys are colorful, easy to use and beginner-friendly.They use popular learning platforms aimed at teaching the basics of programming to children – Arduino and Scratch, and their analogues. 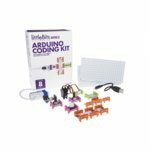 LittleBits Arduino Coding Kit is an intro to programming, that allows creating and coding 8 inventions without breadboarding, soldering, or wiring. USA brand.